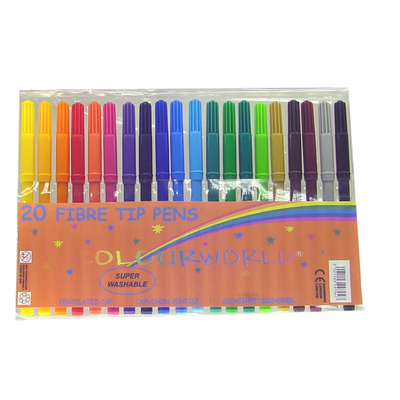 Encourage your pupils to develop their mark making skills with our Colouring Fibre Tip Pens 20Pk. The ideal choice for primary schools, this sizeable pack of 20 felt pens come packaged in a storable PVC wallet which can be used as a protective cover as well as a way of ensuring every colour returns to its place. The small tip allows for great precision while the diverse assortment of colours ensure every project will be catered for. To maintain the quality of your felt tip pens, a secure click down lid also features ventilation slits to prevent moisture build-up of the ink. For other crafting options, our economical Colouring Pencils Box of 288 provides every colour you could possibly need to finish your masterpiece.